Perhaps the best thing about Italy's Armonight is that they don't fit certain musical cliches. They're a female-fronted band with (minor) symphonic and (slight) goth overtones, but Armonight is not trying to be another Nightwish, Delain, or even Evanescence, by example. Armonight: there was a sale on black clothing. Mostly they're a very good melodic rock band with a metal edge. The symphonic notes are apparent throughout, but they're not overwhelming, more like how any power metal band might use synths. They are from Italy after all. Armonight's strength's are manifold. Sy's vocals are strong, mostly clear, sometimes operatic, but certainly not ear piercing (and that's a good thing). She's best on a ballad like When You See Me Cry or anthems like I Will Be There for You and A Kiss in the Snow. Mostly, I'm impressed by the guitar work of Lara and Fjord (everybody uses first names only), the cofounders of the band. They offer rich solos, solid and classic rock and metal lines. Finally, the songs are presented well, in arrangements that display each member's strength and contributions. Say what you will about the evolution or preponderance of female-fronted bands over the last 20 years as they seem to be lurking around every corner. Armonight offers a strong case for classic melodic symphonic rock and metal without bowing or attempting to mimic current conventions. Recommended. 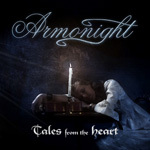 Italy's Armonight offers conventional, but quite entertaining, melodic and symphonic rock with bowing to the current trends of female-fronted bands.